One way to further the work of Bible Faith Mission and empower a generation of Dalit [untouchable] children is to sponsor a student in the BFM School. 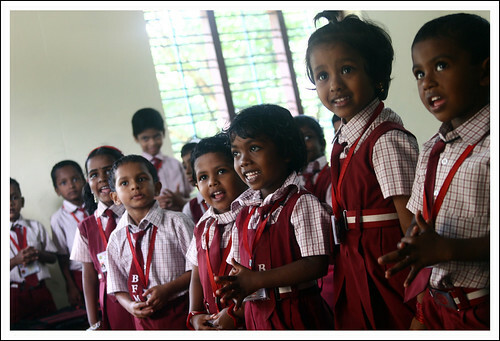 The BFM School uses an international curriculum that is of the highest standard in India. So much so that many high caste families are willing to send their children to a school led by Dalit leaders. It is also significant that this is a school founded by Dalits, led by Dalits and focused in on equipping the next generation of Dalit students. It belongs to the Dalits. We can partner in this move of Jesus in India by sponsoring students. Sponsorship [$25/month] provides for tuition, uniforms and educational material. There are many Dalit children wanting to go this school, but very few can afford it. The demand outweighs the resources. For now. Prayerfully consider sponsoring a child to attend the BFM School. The program is managed by Partners International which is a US-based Christian missions organization that partners with BFM to reach, empower and equip Dalit and Tribal people throughout India. All donations are tax-deductible. :: Scroll to the bottom and click "Sponsor a Child Today!" :: Fill out the online form. :: Under the dropbox "I would like to sponsor a child in...", choose INDIA. Many thanks for your willingness to be a part of what Jesus is doing in India. You can direct your questions and comments to Partners International or to us at info[at]ihaven.org. including us that makes x3!